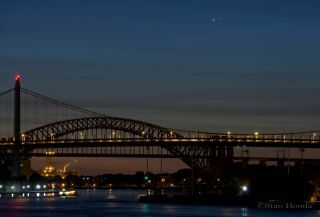 Photographer Stan Honda snapped this photo of the Jupiter-Venus conjunction from New York City. Early-bird stargazers were rewarded with an amazing view this week when of the two brightest planets in the night sky, Venus and Jupiter, paired up for a celestial encounter in the pre-dawn sky. Astrophotographers around the world managed to snap some amazing views of Jupiter and Venus meeting up before sunrise on Monday, Aug. 18. Skywatchers in big cities and rural areas alike managed to capture some stunning views of the planetary tableau. The two planets were separated by just two-tenths of a degree at their closest point Monday. That distance is less than half the apparent width of the moon as seen from the ground. For reference, your fist held at arm's length covers about 10 degrees of sky. Astrophotographer Jeff Sullivan took this image of Jupiter and Venus above Topaz Lake on the border between California and Nevada. Astrophotographer Jeff Sullivan captured an amazing image of the conjunction from Topaz Lake on Nevada side of its border with California. One of his photos even shows four moons of Jupiter circling the gas giant. "The planets Venus and Jupiter put on a show in the sky this morning as sunrise approached," Sullivan wrote on his blog. "As seen from earth, these two bright planets appeared to pass within 0.3 degrees of each other in the sky. For a closer shot I used a crop sensor camera to get a little more effective zoom out of my lenses, and at 640mm equivalent focal length I was able to resolve four of Jupiter's moons!" Another photographer, Chris Schur also managed to capture moons of Jupiter, Venus and the Beehive star cluster in his images taken from Arizona. Chris Schur captured this image of Jupiter, Venus and the M44 star cluster in the night sky on Aug. 18, 2014. Observers can still catch Jupiter and Venus in the predawn sky, however, they won't be quite so close together now. If you missed this planetary meet up, you'll be able to catch another one in about 10 months. Jupiter and Venus will grace the evening sky in 2015. Editor's Note: If you capture an amazing view of Venus and Jupiter together in the predawn sky and would like to share the experience with Space.com, you can send images and comments in to managing editor Tariq Malik at: spacephotos@space.com.